Comments: Eastern chipmunks' presence is usually announced by their chipping vocalizations. They run around nervously gathering and storing food in their underground tunnels. They have bushy tails and reddish-brown fur with dark stripes along their back and face. A litter of 4-5 young are born in April. Longevity is up to 5 years. 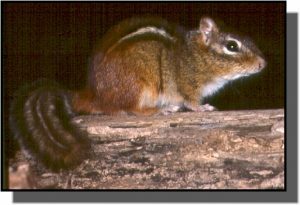 Distribution: Eastern chipmunks range throughout the eastern part of the United States and southeast Canada. They are found in oak-hickory woodlands of extreme eastern Kansas. Food: Eastern chipmunks feed on a variety of nuts, seeds, berries, and insects.